ABP’s recent investment of over £600,000 in modern cargo handling equipment is set to increase capacity and productivity across its South Wales ports of Swansea, Port Talbot, Barry, Cardiff and Newport, ABP says in its press release. The new “MultiDocker” materials handler can be deployed at any of the South Wales ports and has already begun to significantly increase productivity in its current port location of Cardiff where it was used for the first time to handle biomass. 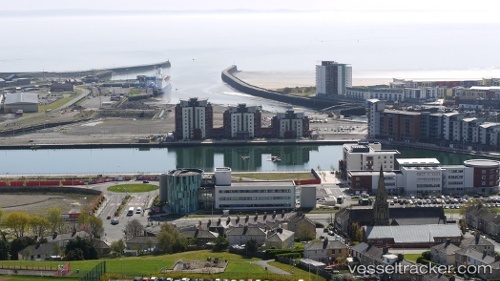 This latest investment by ABP, designed to enhance the capabilities of its South Wales port network, follows a series of investments in the Port of Newport totalling more than £10m in the last 18 months as well as £2.7m in warehousing at the Port of Cardiff. Matthew Kennerley, ABP Port Director for South Wales said: “The new MultiDocker will be used to handle anything from agribulks and biomass to recyclables, steel and forest products. This new equipment is fast, efficient, and mobile, and will increase our cargo handling capability and productivity across the South Wales region.” “It is essential that we make efforts to continually improve efficiency in order to ensure our operations, and those of our customers, remain competitive and that our ports are able to continue to develop and grow.” The MultiDocker (CH70D), which was shipped from Sweden and can be transported by truck, has an outreach of 24 metres with a lifting capacity of up to 17 Tonnes. The wheeled undercarriage also means that the machine can be easily relocated between operational berths. ABP’s ports in South Wales handle over 12 million tonnes of cargo every year and annually contribute £1.4 billion to the UK economy.